It's light—so it's portable; it's strong—so it's durable; and it's 100% recyclable—so it's eco-friendly. Cardboard furniture ticks an awful lot of boxes! 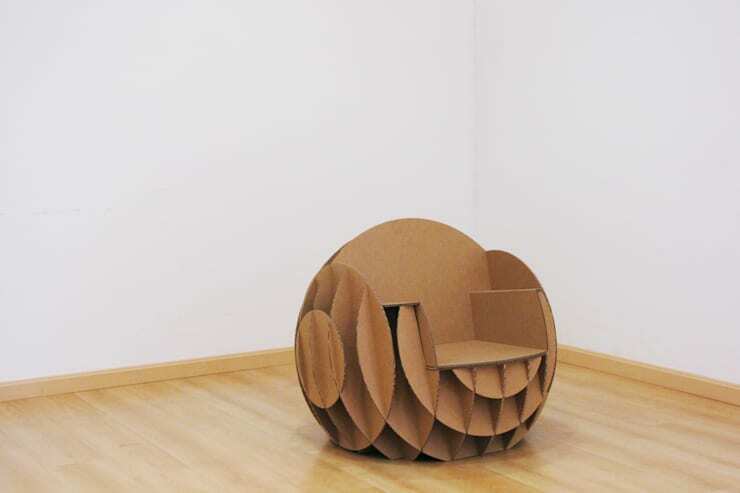 Designs have long moved beyond rectangular stools made from reinforced cardboard, and eco-friendly designers have been letting their imaginations go wild in pushing the forms that cardboard can be folded or moulded into. From lights to chairs to beds, there's a huge range to choose from. Cardboard is light enough to move around easily (great if you like to restyle your rooms frequently); and best of all, if you want to stow your cardboard furniture away for a while you can just fold it flat! If you're concerned about the environment, or just want to try out something quirky and a little different in your home, take a look at our round-up below of some of the coolest cardboard furniture here on homify. If you think cardboard is just for boxes, it might be time to change your mind! This amazing light from Danny Giles is completely handmade. 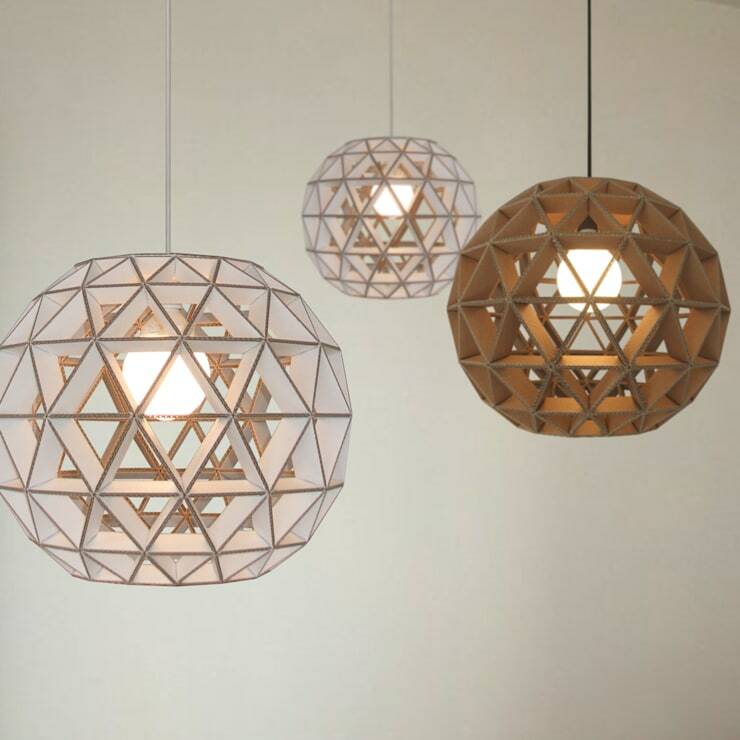 The spherical shape is composed of triangles folded into a repeating geometric pattern. It's a gorgeous piece, that will throw off a gentle, diffuse light, creating a play of shadows and light. 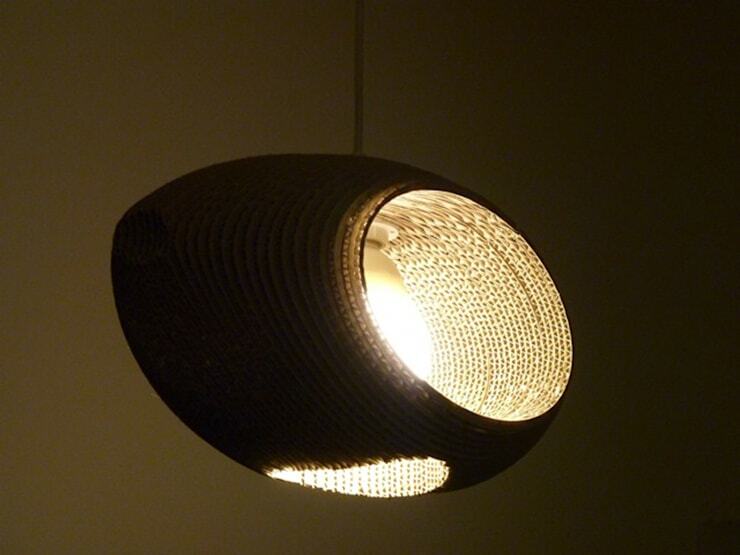 The intricate design and beautiful form of this pendant light is proof positive that you don't need to embrace cardboard solely on ecological grounds—it's a material that should be manna for design lovers, too. This chair, called 'Mesosphere', is from DM Design. Made from two-ply cardboard, it consists of 22 pieces assembled together without glue, screws, or anything else that's usually used in putting furniture together—rather it's ingeniously combined using slots and holes. 'Mesosphere' is little brother to a larger chair called 'Atmosphere' and is more suitable for kids than its big brother. The assemblage is fabulously modern, even futuristic, and study enough to withstand the worst any child could put it through. 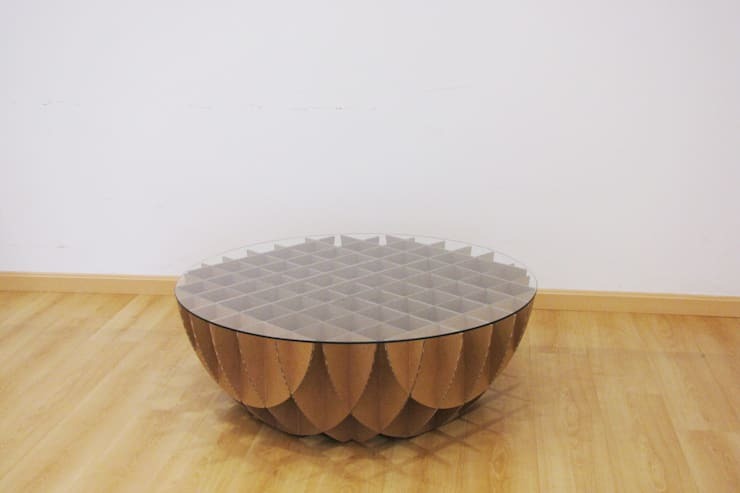 Another piece from DM Design, the most remarkable thing about this coffee table is not so much that its made from cardboard, but the wonderful curves of its geometric base. The square pattern on the top, produced by the interlocking curves of the base, is replicated in the table's shadow; as if the table is magicking up its own rug to sit on. A truly gorgeous design, the fact that it's made from cardboard is simply a bonus. 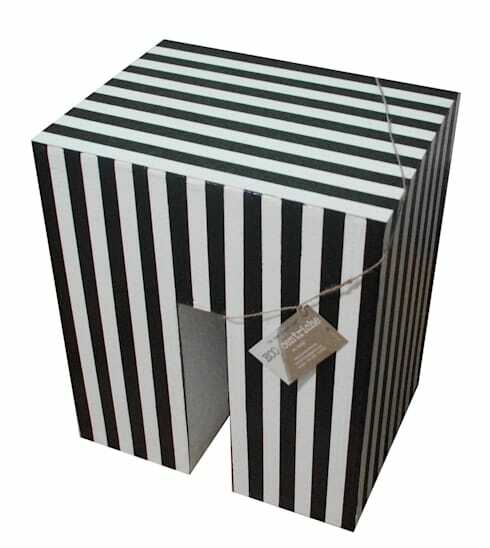 So far all of the pieces we've featured have been in the standard colours one associates with cardboard boxes—brown and white—but another advantage of the material is that it can come in any colour or pattern, as we see in this Stripes pouffe by Ecocentriche Eco Design. Fun, funky and environmentally friendly; we've seen the future, and it might just be cardboard! Stange Design is a Berlin design studio and manufacturers, all of whose products are made of cardboard. Under one roof, they design, develop and produce their cardboard wonders, and they've been doing it since 1985. All of their furniture is made from recycled cardboard, and is itself 100% recyclable. 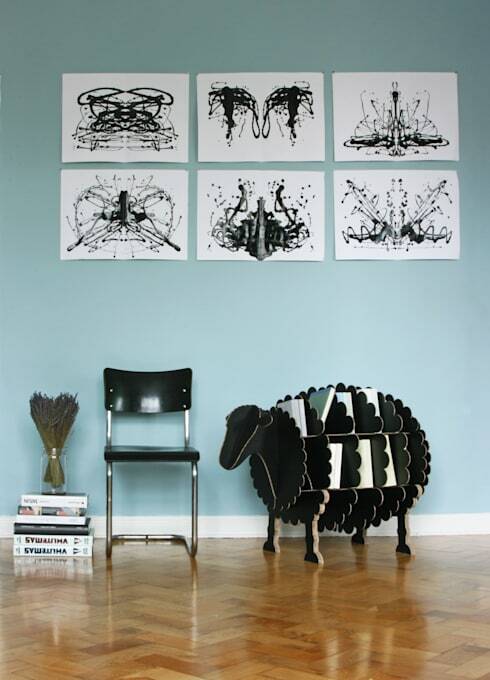 This black sheep bookshelf is ridiculously cute, and would be perfect for a kid's room, living room or home office. Another piece from Stange Design, the Pappbett is much more than a temporary bed: stability and durability are achieved through the use of extra-strong double-wall corrugated board, combined with a tongue and groove assembly (no metal or plastic compounds are used). Repeated assembly and disassembly is possible, and the bed is guaranteed for up to 10 years. The width can be set to either 120, 135, 150, 165 or 180 cm. You don't even need bed slats—the mattress can rest directly on the bed because both the material and construction methods allow for good airflow. 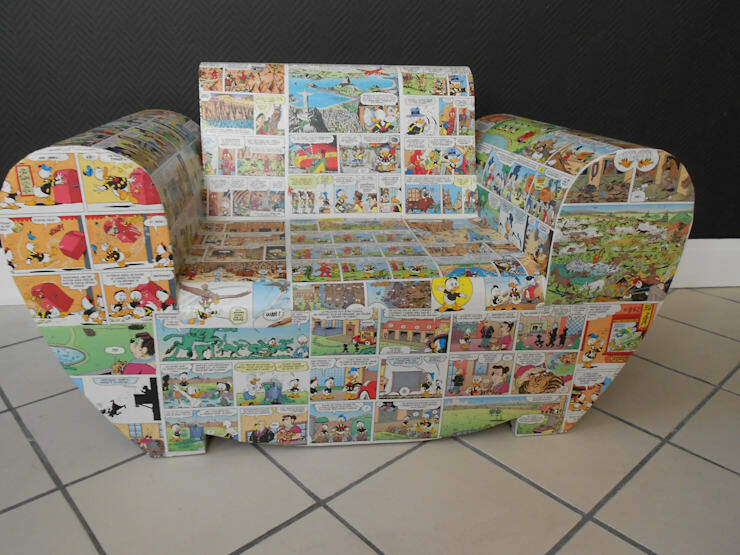 This Carton kid's chair by Chouette has been covered in old comic strips, and then finished for durability. Large and comfy, but strong enough to take a bit of a kicking, we think it's quirky and fun. This cardboard chandelier from Kartun Design is made from multiple pieces of cardboard glued together. Depending on the angle it's viewed from, it looks a bit like an eye, an American football, or even a UFO! The effect is slightly wicker-like—chances are nobody will guess that it's made of cardboard! 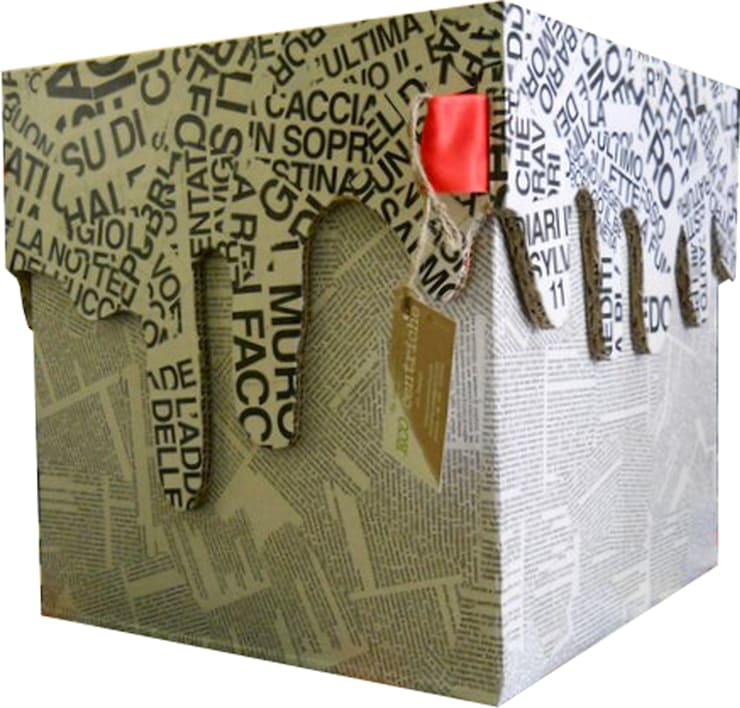 This cute Cubo Parole Pouffe by Ecocentriche Eco Design is covered in old newspaper—recycling in action!—and the top can be removed so the base can function as storage. Would you buy a cardboard bed? What do you think of what designers have managed to do with this eco-friendly material? Let us know in the comments!